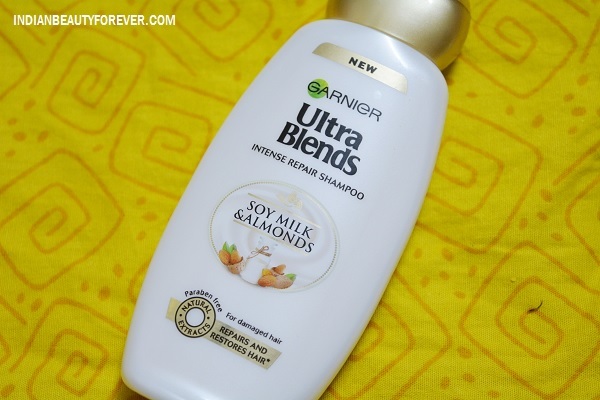 Today, I am going to review Garnier Ultra Blends Soy Milk and Almonds Shampoo. This is the one that I am using currently and has become my instant favorite. There were a total of 5 shampoos and their respective conditioners that were launched the Garnier Ultra Blends Range. Hair is mainly composed of proteins. When damaged, hair loses its protein content and becomes weak. The Ultra Blends paraben Free formulae blended with Soy Milk and Almonds is known for their rich protein content that intensely repairs and restores damaged hair. Discover hair that feels incredibly soft with every wash. Ingredients: A power blend of Soy Milk, known for of its high protein, and Almonds, rich in Vitamin E, together replenish damaged hair and provide deep nourishment. Water, Sodium Laureth Sulfate, Dimethicone, Cocamide MEA, Glycol Distearate, Coco-betane, Alcohol, Sodium benzoate, Sodium Chloride, Sodium hydroxide, PPG-5-CETETH-20, Polyquaternum-6, Salicylic Acid, Hydrolyzed Soy Protein, Linalool, Propolis extract, Capric triglyceride, Fragrance, Carbomer, Geranol, Citric Acid, Citronellol, Laureth-23, Laureth-4, Coumarin, Sweet Almond Oil, Hexyl Cinnamal. 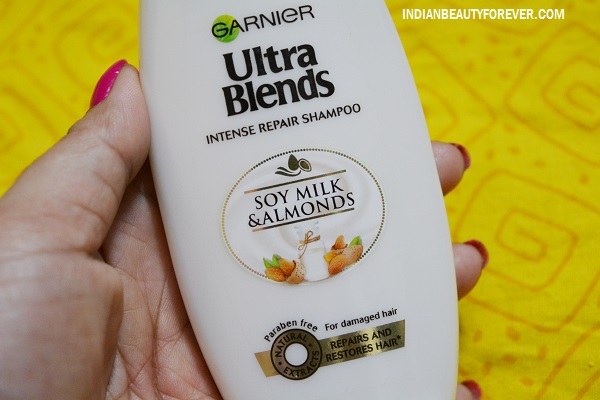 Garnier Ultra Blends Soy Milk and Almonds Shampoo has a similar packaging like the other Ultra blends shampoos and I simply loved these. The flattened bottles look really cute. The sweet smell and milky whitish color makes it pleasing. The shampoo is thick and is not runny in consistency. It lathers so well that it gives a nice wash even when little bit is taken. The sweet smell that it leaves behind is another plus point. Price is also extremely affordable. 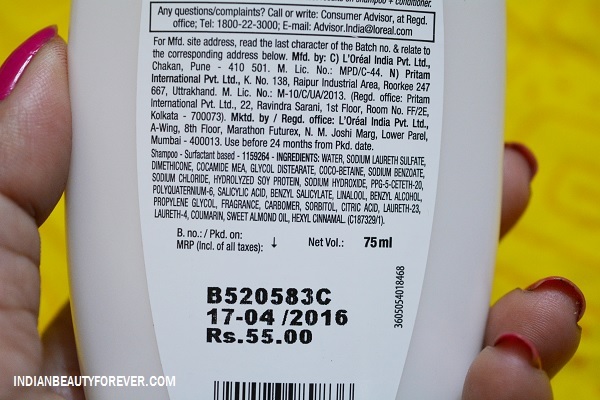 The small 75 ml pack costs just rupees 55. These are travel friendly too. The shampoo lathers easily and the satiny rich creamy lathers cleanse the scalp well and gets rid of the dirt, sweat, product build up well without over drying the scalp. After the wash, my hair feels very soft and the faint smell is also a thing that makes me like it even more. The soya proteins and almond oil makes the hair stronger and smoother but I am not sure whether it actually has that or in what amount. Anyways, I am happy with this shampoo and definitely would re-purchase. Garnier Ultra Blends Soy Milk and Almonds Shampoo is an excellent shampoo if you have oily to normal hair. It lifts the impurities and dir t well and keeps the hair softer. For very dry hair, it may not be very suitable but yet can be tried.